With the Eyes wide shut look we wanted to create something that was very easy for anyone to recreate but at the same time gory and intense enough to turn heads at costume parties. Inspired by the look of classic masquerade masks of the olden days the Eyes wide shut makeup gives the illusion of having your skin ripped off around your eyes and cheeks. The wound itself will then reveal the bones of your skull as well as a big bloody mess. The creation process is pretty straight forward and we believe this is so simple to recreate that it might become a favourite with many beginners and aspiring sfx makeup artists out there. We’ve basically only used liquid latex, cotton and red yarn to achieve the whole effect. Of course there’s some colour and fake blood as well, but other than that, very basic. If you want to you can use the exact same method to create similar wound anyehere on your body. Perfect if you need some exposed bones or deeper wound for your independent movie project or Halloween party. And for all of those who wonders the answer is no. This makeup has nothing to do with the movie Eyes Wide Shut starring Nicole Kidman and Tom Cruise. We just thought the name Eyes Wide Shut fit this Halloween makeup tutorial perfectly. You guys should do like The Black Death or The Spanish Flu or some other bubonic plauge. Can you do a terrifying tutorial for people with glasses that are not able to wear contact lenses? I have a new reason to love Sweden. lol.. Thanx guys. how do you guys remove latex? whenever I remove it, it hurts really bad. is there some product I should be using? I tried doing this look yesterday and put on a Santa hat and sent everyone Merry Christmas messages with a photo that way :-D It was a lot of fun creating the look and also freaking people out. What kind of costume would you wear with this? I want to do this tomorrow but I am drawing a blank for costume. Jo Thomas a long red dress With a leg slit. or, for boys; tight red dress shirt with black pants. You'll look classy yet dead. damn spooky af, ill try this ._. Is It Okay To Put The Liquid Latex On Your Eyebrows ? & Btw Great Video!!! AyeJaz☯ noooooooo! Always put a barrier on your eyebrows! Otherwise you WILL rip your eyebrows out. Thanks to you guys i won a 2nd place in ahalloween contest yesterday. But the latex only lasted for hours on my face. Any suggestions to make it last longer?? I really want to do that for halloween, but I'm a little bit concerned about me eyebrows. Were there no problems in removing the latex from the eyebrows? I can't wait for the cosplay channel!! 1:20 Josh is that you? Thanks a lot for your videos. I try this one and it looks awesome. What paints/make up do you use? i wonder how this would look with neon or more pop art colors? What color palette are you using? Does anyone know where they get that huge brick of cotton from?? I cannot find something similar anywhere! When someones literally making it look like the skin is being ripped from around their eyes AND talking about future videos. Bro, I can barely walk properly let alone do 2 things this important. Since you put the latex on the skin first, is it possible to just 'peel' this off and reuse it another time? Or do you have to redo it everytime you want this look? Do a carved pumpkin face! Also the Vaseline is enough to protect your eyebrows from the latex? Should you cover brows with glue and powder before latex? what is the song in the opening ? 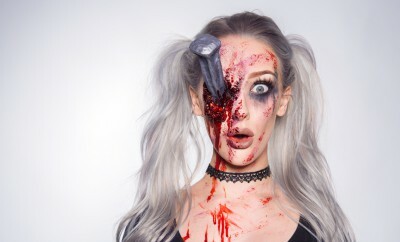 Would it be possible to do this look using a face cast if we have one? With the liquid latex and flour mixture that you use sometimes? Asså åh ja! Tänker så testa denna inför halloween i år! can i implement this into some of your clown makeups? Hey, you guys do an awesome job with your makeup! You know what would be really funny? If you did a prank with the makeup on or just walked around in public with it! looks disgusting.. I love it! What did you use for the white, black, brown, orange, and red colours?